You are given n points in the coordinate plane. Write a program which calculates the largest possible area of a rectangle such that each of its vertices is one of the given points. You may assume that such a rectangle exists. The input is read from standard input. The first line of input contains an integer n (4 ≤ n ≤ 1500), the number of given points. Each of the following n lines contains the coordinates of one point, two integers separated by a space. The coordinates will be between -108 and 108. Output should be written to standard output. 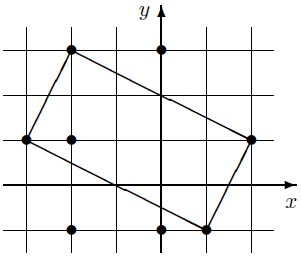 The first and only line of output should contain a single integer, the largest possible area of a rectangle. For test cases worth 20% of the total score, n ≤ 500.